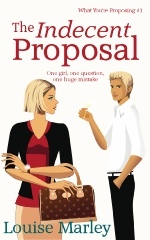 What You’re Proposing is a series of five novellas about a rock band. Each story is complete (no cliffhangers!) and with a different set of characters. They can be read in any order, but if you do want to read them in order, they’re helpfully numbered! You can currently download The Indecent Proposal, from Smashwords for free, or read it on Wattpad. You can also download it from ebook retailers, such as Amazon UK, Amazon USA, Kobo, Nook and iTunes, although I can't guarantee it will be free on all sites, as it is up to each company to decide how much they will charge. When the celebrity Keira works for fails to turn up to open the village school’s fete, it falls to her to find a last-minute alternative. Who better to ask than her old school friend, Jedd? After all, he is the guitarist with a famous rock band. And … erm, a notorious hellraiser. What could possibly go wrong? 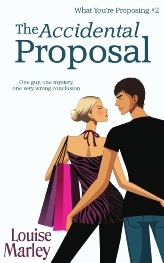 You can currently download The Accidental Proposal from Smashwords for free, or read it on Wattpad. You can also download it from retailers such as Amazon UK, Amazon USA, Kobo, Nook and iTunes, although I can’t guarantee it will be free on all sites, as it is up to each company to decide how much they will charge.